February 11, 2019 - Be My Valentine! November 20, 2018 - Black Friday through Cyber Monday Sale! November 10, 2018 - Dolly and Me! October 2, 2018 - New BOM, new Fabric, new Service...it's all here! February 1, 2017 - Because sometimes you really DO need it in a weekend! January 31, 2017 - It's BATIK LOVERS DAY! January 17, 2017 - Join Us Tonight! January 5, 2017 - New Classes and BOM's! December 27, 2016 - Will You Get Yours? December 24, 2016 - Merry Christmas from all of us at Cotton Candy Quilts! December 22, 2016 - Holiday Hours and FREE For You! December 18, 2016 - Twelve Tuesdays of Christmas, Week THIRTEEN! December 12, 2016 - Twelve Tuesdays of Christmas, Week TWELVE! December 11, 2016 - If you Open JUST ONE email today, open this last Santa Baby! December 10, 2016 - Welcome To "Santa, Baby..." Day ELEVEN! December 9, 2016 - Welcome To "Santa, Baby..." Day TEN! December 8, 2016 - Welcome To "Santa, Baby..." Day NINE! December 7, 2016 - Welcome To "Santa, Baby..." Day EIGHT! December 6, 2016 - Welcome To "Santa, Baby..." Day SEVEN! December 5, 2016 - Twelve Tuesdays of Christmas, Week 11, Santa Baby, Day Six! December 4, 2016 - Welcome To "Santa, Baby..." Day FIVE! December 3, 2016 - Welcome To "Santa, Baby..." Day FOUR! December 2, 2016 - Welcome To "Santa, Baby..." Day THREE! December 1, 2016 - Welcome To "Santa, Baby..." Day TWO! November 30, 2016 - Welcome To "Santa, Baby..." Day ONE! November 28, 2016 - The Twelve Tuesdays of Christmas, Week TEN!!! November 21, 2016 - Twelve Tuesdays of Christmas Week NINE! November 14, 2016 - Twwelve Tuesdays of Christmas, Week EIGHT! November 8, 2016 - Twelve Tuesdays of Christmas, Week SEVEN! November 1, 2016 - The Twelve Tuesdays of Christmas Week SIX! 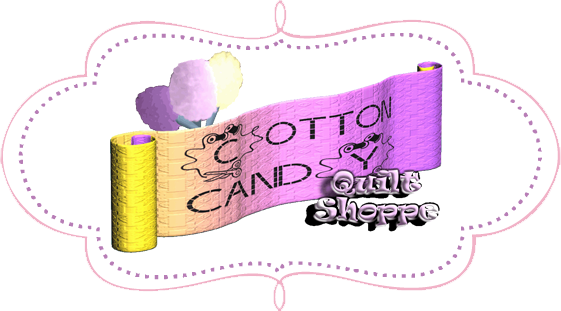 October 21, 2016 - Next Week at Cotton Candy Quilts! October 17, 2016 - The Twelve Tuesdays of Christmas, Week FOUR! October 10, 2016 - The Twelve Tuesdays of Christmas, Week THREE! October 5, 2016 - So What is a "POM"? October 3, 2016 - The Twelve Tuesdays of Christmas, Week TWO! September 26, 2016 - The Twelve Tuesdays of Christmas Starts NOW! September 15, 2016 - Schedule Changes and Pretty Pictures! September 4, 2016 - Deal Me IN! September 1, 2016 - SuperQuilter Reschedule! August 25, 2016 - Two New Kits and an Added Class! August 15, 2016 - SEW, SEW MUCH to Show You! July 28, 2016 - Time for Some Housekeeping! July 13, 2016 - Time For Cake! July 4, 2016 - They Say it's Your Birthday! It's Our Birthday, Too! June 27, 2016 - Summer School! June 19, 2016 - TWO MORE DAYS!!! May 11, 2016 - A New Age Starts This Week! May 2, 2016 - CONGRATULATIONS PINK BAG PEOPLE! May 1, 2016 - "The Year of the Finished Quilts"
April 20, 2016 - Road Trip!!!! April 13, 2016 - BOM's! April 10, 2016 - April Day Retreat---UF"Over It!" April 5, 2016 - SUPERQuilter Rescheduled! April 2, 2016 - Whoopsie! March 30, 2016 - So it IS you that's winning the 200 Grand Prize! March 27, 2016 - It's a WHOLE NEW AGE! Plus April Classes! February 29, 2016 - Last Day to LEAP into Savings! February 26, 2016 - Let's Do The Time Warp Again! February 23, 2016 - Hup One, Hup Two! February 9, 2016 - I'm getting married in the morning! January 27, 2016 - February Day Retreat Mystery Quilts! January 25, 2016 - Can You Come Out and Play? January 11, 2016 - Squirrel! January 7, 2016 - Your Amish with a Twist III begins NEXT WEEK! January 7, 2016 - Your Gingerbread Village Block of the Month Begins! December 14, 2015 - Twelve Tuesdays of Christmas, Week 11!